Columbus – March 29, 2016 – Columbus-area women are invited to the community’s inaugural fitness-inspired happy hour 5K/10K, hosted by the nation’s premiere event series for women, Gildan Esprit de She, in Genoa Park on Thursday, September 22. Registration is now open at EspritdeShe.com. Produced by Life TimeSM – The Healthy Way of Life Company, Gildan Esprit de She will host runners, joggers and walkers alike in Columbus’ first-ever designer event encouraging women to “Be Your Potential” and inspiring a lifestyle that unites women, families and communities through a foundation of fitness and empowerment. Happy hour or workout? Now, women don’t have to choose. Following the timed 5K or 10K, women of all paces and passions will enjoy Gildan Esprit de She’s Lifestyle Market featuring a Bubbly Bar with complimentary champagne and wine, healthy eats and live acoustic music. The fun and festivity continues at the Panasonic Beauty Bar powered by Life Spa where women will enjoy manicures, massages, or hair braiding and the souvenir photo booth brought to life by The Vision Council. Columbus is home to a vibrant community of empowered women—the perfect setting to expand Gildan Esprit de She’s reach and activation with national partners including Gildan, Panasonic Beauty, Poise, Pure Silk, Specialized Women, The Vision Council, and national charity partner Girls on the Run—a physical activity based, positive youth development program for girls in the third through eighth grade. The race venue at Genoa Park showcases the recent expansion of green space supported by the Scioto Greenway Project. The area is also home to several Life Time Fitness destinations, including Dublin, Easton and Upper Arlington. As a leading charity partner of Gildan Esprit de She since its inception four years ago, Girls on the Run inspires girls to be joyful, healthy and confident using a fun, experience-based curriculum that creatively integrates running. The mission of Girls on the Run aligns in strong parallel with Gildan Esprit de She; helping women of all ages lead confident and joyful lives. During registration, athletes will have the opportunity to donate to Girls on the Run and are invited to become a coach or volunteer. To learn more about the local Girls on the Run Franklin County council, visit girlsontherunfranklincounty.org. Runners registered by April 15 will receive a bonus gift of yellow Panasonic headphones in addition to many fashionable freebies including a Mondetta performance running tank ($40 value) and reusable gift bag, both branded with the 2016 annual series theme Be Your Potential, plus a customized race bib (if registered by July 31), free post-race photos courtesy of The Vision Council and more. 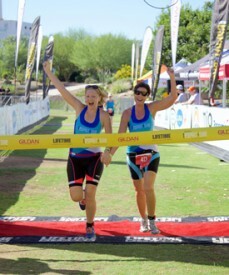 To RSVP for any of the Gildan Esprit de She events, visit the series official website at www.espritdeshe.com. Follow Gildan Esprit de She on Twitter @EspritdeShe and on the Esprit de She Facebook page. Life Time is a privately held, comprehensive health and lifestyle company that offers a personalized and scientific approach to long-term health and wellness. Through its portfolio of distinctive resort-like destinations, athletic events and corporate health services, the Healthy Way of Life Company helps members achieve their goals everyday with the support of a team of dedicated professionals and an array of proprietary health assessments. As of March 29, 2016 the company operates 119 centers in 26 states and 35 major markets under the LIFE TIME FITNESS® and LIFE TIME ATHLETIC® brands in the United States and Canada. Additional information is available at www.lifetimefitness.com.